Across the country, teachers are looking for ways to share more nonfiction with children. I hope that families think about doing the same as they read with their children. True stories inspire us, stir our curiosity and make us think about our own place in the world. If you are looking for a wonderful book to read aloud with your children, please look for Hand in Hand: Ten Black Men Who Changed America. Andrea Davis Pinkney wrote this book to inspire young people by sharing with them stories of Black men who refused to give up, who pursued their own dreams and who gave all in order to change our country for the better. As she writes in her introduction, she had "grown weary of so much bad press and ignorant stereotyping of black males. ... Even in its sublest forms, this 'bad press' can stitch a corrosive thread into a kid's psyche and cause him to believe he is inferior or flawed." Throughout each story, Pinkney shows how these important men stood by their own beliefs and refused to bend to the pressures of such negative stereotypes. 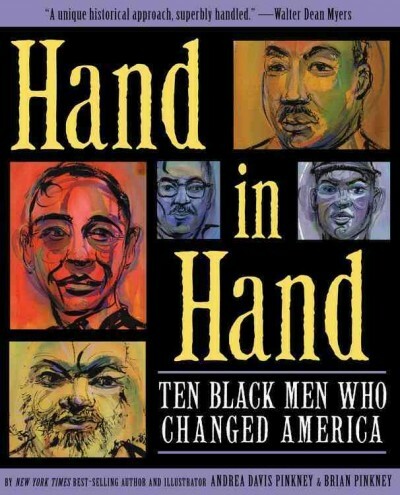 Ten short chapters, each ranging from ten to fifteen pages, are arranged chronologically, focusing on distinguished Black men ranging from Benjamin Banneker to Thurgood Marshall to Martin Luther King, Jr. There are no real surprises in the subjects she covers, but Pinkney sheds light on each subject, bringing them to life for children who have heard of them but probably do not know much about their accomplishments. "Master Hugh's anger taugh him (Frederick) that reading was powerful. If others believed that knowledge made him unfit to be a slave, he would work hard to get as much of as he could." The writing is clear and accessible for children interested in learning more than a picture book biography can share. Pinkney's writing shines when she is writing with conviction to persuade readers of the importance of these men and their lives. "Thurgood (Marshall) grabbed on to his law courses and books like a man seizing a life preserver. He wanted to change the way life, liberty and property were upheld for African Americans. This mission was life to him." At each step, this book begs to be read aloud. Pinkney's writing flows with conviction and grace. A lot of professionals are talking about the Common Core and what it might mean for the way we teach. I hope that teachers and librarians look to books like Hand in Hand to see how we can read more nonfiction aloud with children. Only if we can show that we find nonfiction fascinating, inspiring and stirring, we can encourage our children to read more on their own. Find more nonfiction to share with your kids at Nonfiction Monday. Today's roundup is being hosted by Travis Jonker over at 100 Scope Notes. Check it out - it's chock-full of resources! The review copy was kindly sent by the publishers Disney / Hyperion. If you make a purchase using the Amazon links on this site, a small portion goes to Great Kid Books (at no cost to you!). Thank you for your support. HI Mary Ann, Terrific review! I particularly like the Thurgood Marshall excerpt. Thanks for sharing this book -- I'm off to find it! Linked to this on Pinterest. I have this book on my TBR pile and will be posting about it soon. Thanks for the great review!